Lay a bare foot on a paper and draw the outline. Take two furthest points from each other and make a vertical line to the edge of the paper (A dashed line on the picture below). Put the ruler to the paper - the starting point 0 will begin on the first line. The second line will show us the measured value. 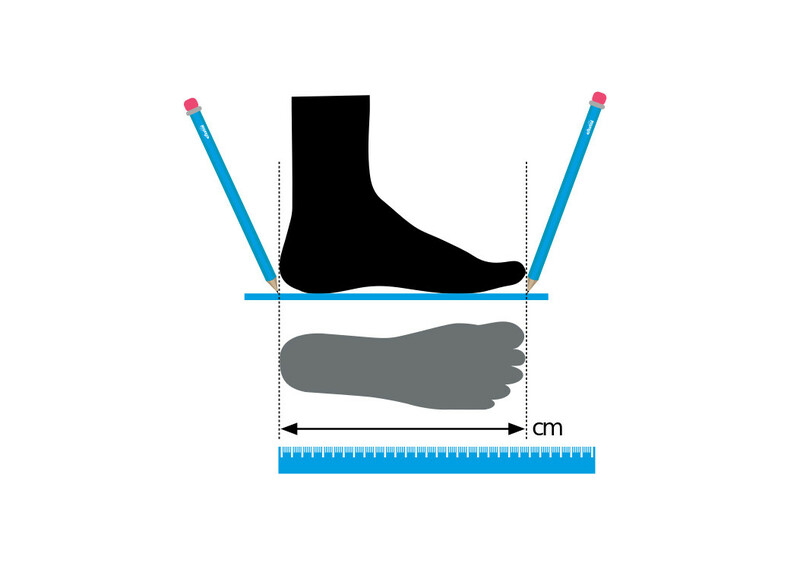 For example: Player's foot on the paper is 26cm long. We add 0,5cm to those 26cm, so the final value will be 26,5cm! We remember or write down this final value. Now choose floorball shoes you would like to purchase at our shop. Once you choose the shoes you like, you'll find 4 different sizes (UK, EU, US, cm) directly on the product. E.g. in our example, we need a size of 26.5cm, which for Asics is UK size 7.5 = EU 42 = US 8.5 So you can order this size. If you still are not sure, don't hesitate to contact us , we will be pleased to help you with a choice. Notice: Do not measure your feet in the morning because heet and activity may cause its outspread. The best time for measurement is in the evening.